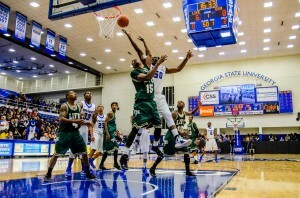 The GSU Sports Arena is home to the men's and women's basketball teams, volleyball team and future home of the sand volleyball team. Patrick Duffy | THE SIGNAL. The Georgia Dome and Sports Arena, both located in the heart of Downtown Atlanta, serve as the hubs of Georgia State University athletics. Each are unique facilities in their own rights and offer players, fans, and alumni different game day experiences as the root for the Panthers. The Signal recently spoke with several members of the athletics department, Georgia State student-athletes, students and fans about each venue and asked them what they liked, disliked, would like to see change and how feasible are the possible changes. The following is a small portion of the information that The Signal was able to acquire and shows that the Georgia Dome and Sports Arena are both unique, and ever evolving. 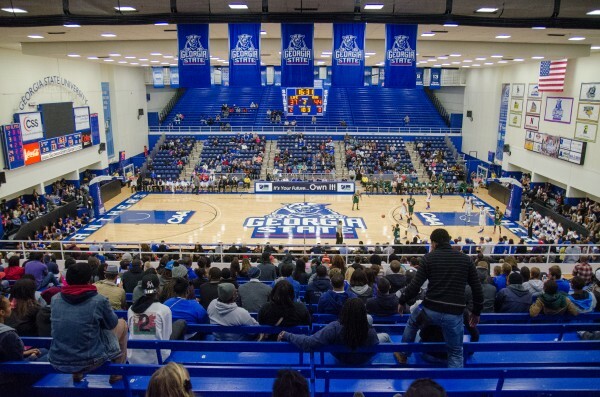 The GSU Sports Arena is home to the men’s and women’s basketball teams, volleyball team and future home of the sand volleyball team. Patrick Duffy | THE SIGNAL. The Georgia Dome, owned by the state of Georgia and operated by the Georgia World Congress Center Authority, is an internationally known sporting facility with an overall capacity of over 70,000. It first opened in 1992. Its primary tenant is the Atlanta Falcons, but its high status also allows it to play host to many other sporting events including the SEC Championship Game and this year’s NCAA Men’s Final Four. The Georgia State football played their first game in program history inside the Georgia Dome on Sept. 2, 2010 in front of a crowd of 30,237. The Panthers have an 8-11 home record in their three seasons of existence. It too has some international significance as it was the home of badminton when Atlanta hosted the 1996 Olympics. 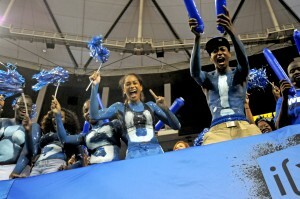 The Georgia Dome can make for a raucous atmosphere during a Falcons games, but slightly less so for Georgia State football as the capacity is just under 30,000 (the upper bowl is not open for use during Georgia State games). Even so, the simple fact of sports being played in a venue such as the Dome is more appealing to some. The Sports Arena, with a seating capacity of around 4,500, may be smaller than the Dome, but is also no shortage on energy when a game is taking place. 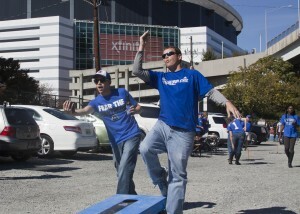 Its more intimate nature can provide for a more electric atmosphere than a Georgia State game at the Dome, but sporting preferences give it an edge in some fans’ opinions. “I prefer the Sports Arena over the Georgia Dome because I like basketball over football,” sophomore Torrie Wilson said. In order to play at any sport, a program needs the most important element—players to play in an arena. Each venue offers contrasting experiences for players as well. For football players, having the opportunity to assume the same turf played on by the Atlanta Falcons is exhilarating for them. But given the infancy of the program, that added element to Georgia State football games may be daunting for the roster. “I like the Sports Arena because it’s small and it seems like when more people come and it’s packed, it just looks better,” White said. When they do come, they’ll likely take sit in one of the sections of seats rising upwards from the sidelines up towards the ceiling of the building. 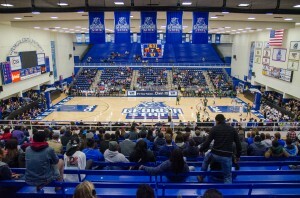 While the majority of larger basketball arenas have seats circling the entire circumference of the stadium, but this common feature is not currently present at Georgia State’s Sports Arena. Persuading players to compete in your university’s venues is the job of a school’s recruiters. Georgia State University recently signed 27 recruits to its football team in what, overall, is being seen as a good class of newcomers under new head coach Trent Miles. Since Georgia State’s football program is still in building mode towards the future, it needs a strong recruiting pitch to prospective athletes out of high school, especially given that it is competing with traditional football schools in the Southeast such as Alabama, Florida, LSU, Georgia Tech, UGA and Georgia Southern. One of the things the athletics program is banking on is the opportunity for football players to play home games in the same stadium that the Falcons play in. The Sports Arena also has a bargaining chip for recruiting given that it is in Downtown Atlanta. While Georgia State maintains its desire to create excellent fan experiences at both the Dome and the Arena, arenas do come with issues over time. The Sports Arena is now more than 40 years old and some say the Georgia Dome is aged as well, despite its only 21 years of existence. The university does not own the Georgia Dome, so changing it drastically for its purposes is far less feasible than the Sports Arena. The Arena currently has no leather seating in the stands. One change to the facility will happen by next year is the conference paraphernalia. The CAA logo that is visible on both painted ends of the basketball court will be replaced as Georgia State athletic programs will fully join the Sun Belt Conference beginning next season. There are flags that feature the logos of each CAA school as well as the conference itself inside the Arena. Those flags are on the end of the Arena adjacent to Piedmont Street and will have to be removed as well. While basketball and volleyball will still share the Arena next year, it can be as much of a challenge on players as it is on the maintenance staff and athletics department. The big issue that has many talking, both around the Georgia State campus and throughout the rest of Atlanta, is the Atlanta Falcons possible move to a new stadium. The new stadium is currently still in the planning stages, but there appears to be a strong consensus that the deal will get done and that Arthur Blank, owner of the Falcons, will get his new, downtown stadium. A new Falcons’ nest would also mean a new Panthers’ den for the football team. Georgia State recently unveiled its Master Plan to relocate most of their athletic facilities at Panthersville, located in DeKalb County, within walking distance of the main campus. The university claims the project will cost $80 million, will be funded through private donations, and the facilities will be built when the funding is available. The Sports Arena renovation plan includes a new Ticket Plaza, Walk of Fame and Team Store and increased seating that will stretch around the court.